This book introduces the method of lower and upper solutions for ordinary differential equations. This method is known to be both easy and powerful to solve second order boundary value problems. Besides an extensive introduction to the method, the first half of the book describes some recent and more involved results on this subject. These concern the combined use of the method with degree theory, with variational methods and positive operators. The second half of the book concerns applications. 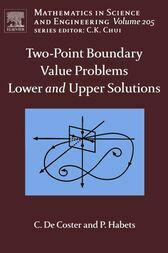 This part exemplifies the method and provides the reader with a fairly large introduction to the problematic of boundary value problems. Although the book concerns mainly ordinary differential equations, some attention is given to other settings such as partial differential equations or functional differential equations. A detailed history of the problem is described in the introduction. "...essential for researchers in this field."